Enerjex 801 is an efficient electrolyte developed for the electropolishing and de-burring of stainless steels and related materials. Enerjex 801 will produce a "micro-smooth" finish, increasing the "clean-ability" of stainless steel surfaces whilst enhancing the material's passivity and resistance to corrosion. The results achieved will depend greatly on the starting condition and surface structure of the material to be processed. 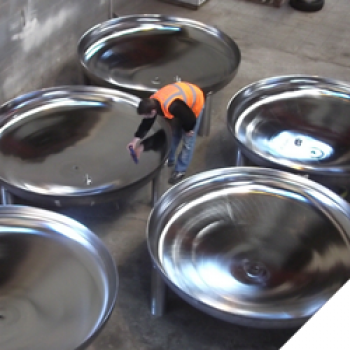 The electropolishing process requires an acid-resistant tank fitted with a cathode/bus bar arrangement, along with a rectifier of suitable capacity to cope with the type of work being processed. In addition, specially designed jigs, constructed of titanium are required to mount the work in the process tank, to facilitate electropolishing. Operating conditions and parameters (temperature, time, current density, etc) will vary according to the type and composition of component being processed. Stainless Restoration Ltd have many years of practical experience, and are able to offer advice, and supply equipment in order to enable customers to carry out electropolishing operations at their own sites. Supplied in 25lt, 200lt and 1000lt Polyethylene containers.